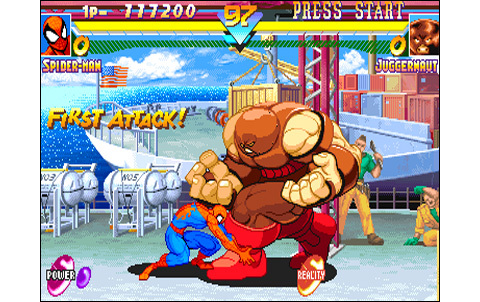 We already knew that Capcom was particularly fond of muscular and/or charismatic characters inspired from american comics, by including them in many of the latest firm's beat 'em up (Captain Commando, Cadillacs & Dinosaurs, The Punisher ...), but also with X-Men Children of the Atom, released late 94. 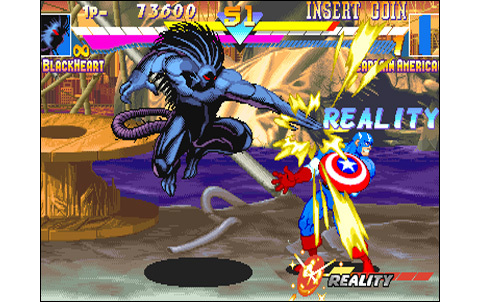 Marvel Super Heroes is the first sequel of this "X-Menesque" versus fighting game, still running on the powerful CPS-II. 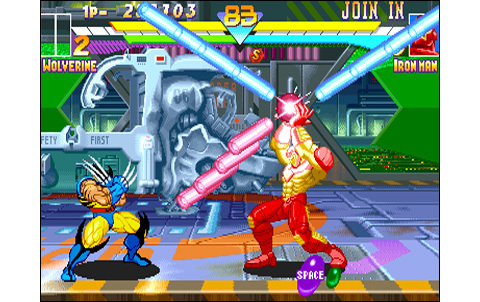 The coup is that the roster has been significantly renewed since the first game, except for Wolverine and Psylocke who were kept, plus Juggernaut and Magneto who are now playable: other superheroes have gone by the wayside, but it may be to better come back in a future episode? 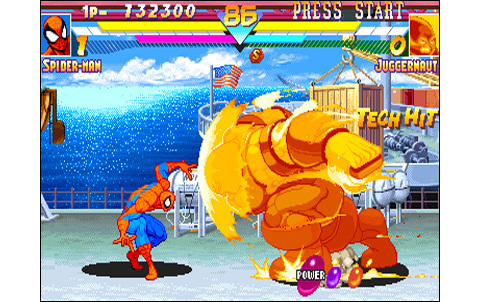 There 's still only ten selectable characters but now three new Bosses, accessible via a code, providing a total of thirteen fighters. 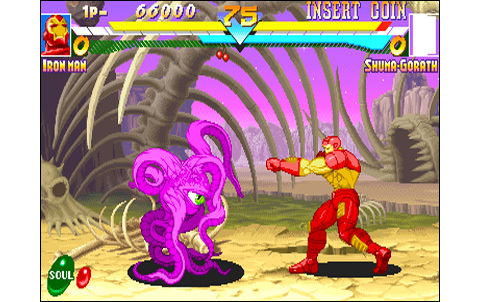 Apparently, Capcom decided to renew consequently its "versus fighting" gallery since the end of 1994, with new franchises such as our two X-Men games, Darkstalkers featuring vampires and other lurk creatures but also Street Fighter Zero, with which the saga of the company re-starts from zero (this is the case to say, haha). New graphic styles, new animations, new sound compositions ... but also new rosters! 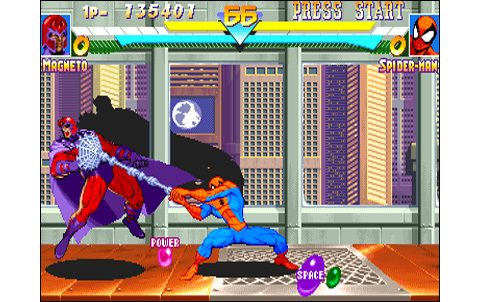 The problem is that Rome was not built in a day, and suddenly, the seventeen characters of SSFII Turbo are a distant memory! All these new productions "only" pack ten selectable fighters, plus generally one to three Bosses. This is the case for our Marvel Super Heroes, but when we know that in the list, we'll be able to embody Hulk, Wolverine or Spiderman, the pill goes a little better ... especially for the fans of Marvel comics ! MSH offers twelve backgrounds, one for each character ( with the exception of Anita, a Boss) and the least we can say is that we're dealing with a set of high caliber ! 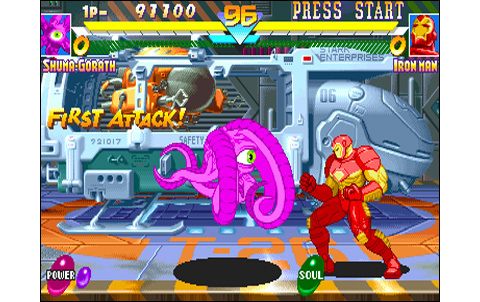 If the expanse of desert decorated with prehistoric skeletons at Shuma Gorath's is literally sublime , the stage featuring two cargo at Juggernaut's is very beautiful too... just to name a few. 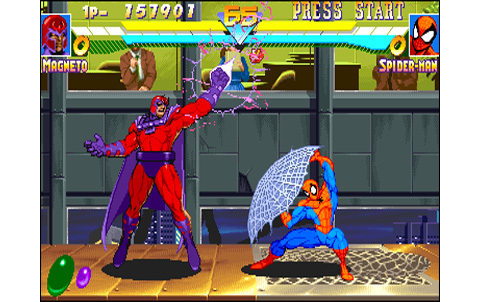 There's also Spiderman fighting on a window cleaner cradle moving outside of a building, or Magneto in its impressive spaceship: gorgeous! In this sumptuous table we have to mention the sprites, perfectly drawn , respectful of the original comics designs: chapeau, Capcom! And the editor has raised its characters' animation to a level rarely reached before : what fluidity ! 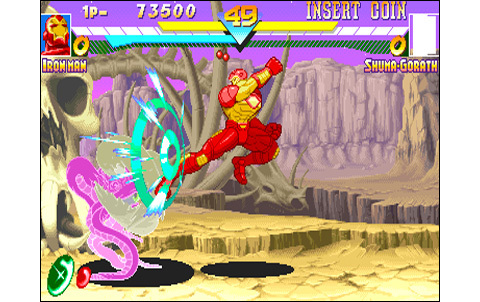 All the fighters have smooth ways of walking and moving, using an important number of frames, accorded to an ideal speed: players even can choose between "Normal" or "Turbo" , but in both cases , the action is compelling and dynamic . 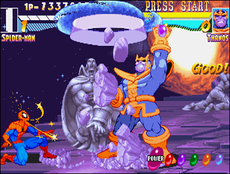 Turbo will therefore be reserved for experts , experienced in the game mechanics! There's only the soundtrack that is a little off compared to the rest of the realization, sounding a little impersonal and finally not too much memorable. Voices, impact sounds and musics are quickly forgotten, but nevermind: the job is done with the usual audio quality, and in the end that's all we ask for! 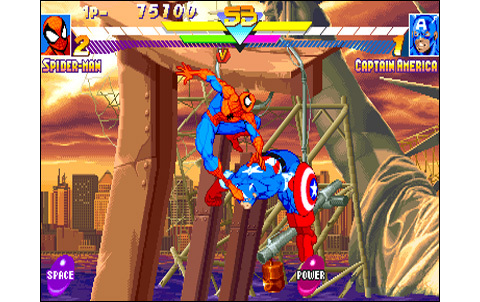 The gameplay is interesting, with a six-button system borrowed from SFII; however, an "aerial" dimension was given to the fights, which takes a bit off the beaten tracks. Special attacks are spectacular and many combos are waiting to be learnt, all this providing great fun to the action, single or two. In addition, the technical aspect is not uninteresting, and every character tends to be played quite differently from all others. 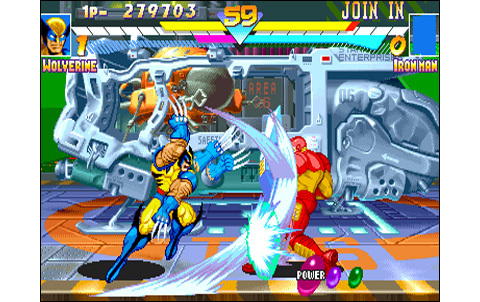 Of course, this is a X-Men game, with all the "straightforward" style we know the saga, which also makes it a hit with younger players... But wait, isn't it also what we expect from a real good fighting game? Backgrounds uses the Comic style with more or less success, with beautiful colors and perfectly mastered reliefs. Characters are nicely drawn, faithful to the "paper" versions. Capcom once more did a pretty good job for the smoothness of the animations, plus the game speed can be set! 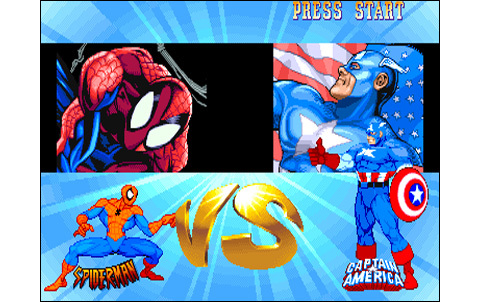 Only the backgrounds are a little simplistic compared to the rest. 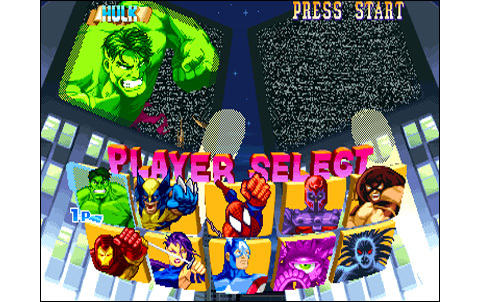 Marvel Super Heroes features ten selectable characters, plus the game's three Bosses that are accessible through a (tough) code. 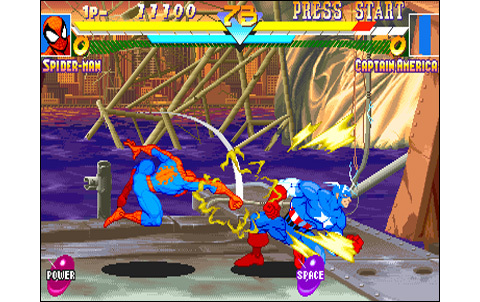 Combos and specials provide it a good replay value... but ten is few, and MSH probably won't stand as your "first pick" during fighting games nights with your friends! 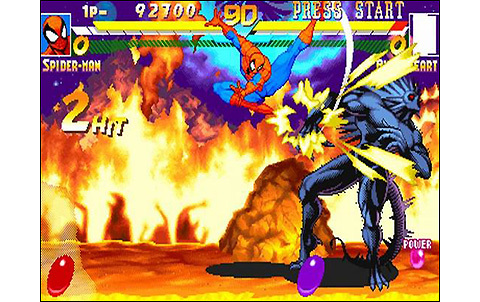 The variety of attacks and basic moves is large, like the amount of combos and specials. 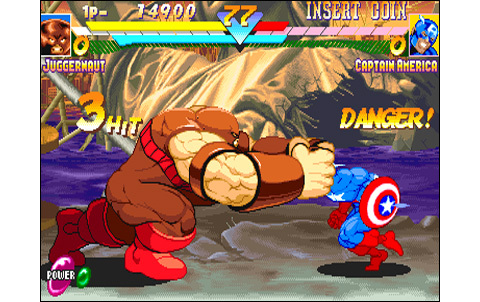 Controls are nice and without standing as too technical, the gameplay provides some change since the Street Fighter games! 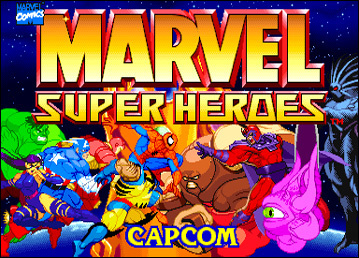 Marvel Super Heroes, it's Capcom's savoir-faire with VS fighting associated to the X-Men bestiary... so let's say a heavy caliber production! 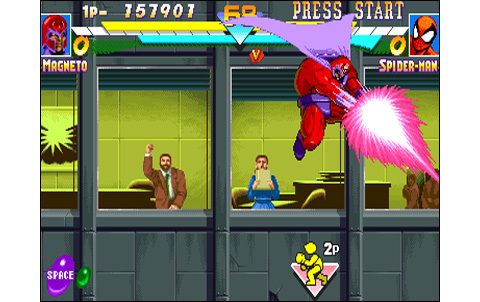 As surprising as it seems, I first think about Visco's Breakers when it comes to a similar game on the Neo Geo! The gaming sensations are close enough, even if the characters are (a little) different. 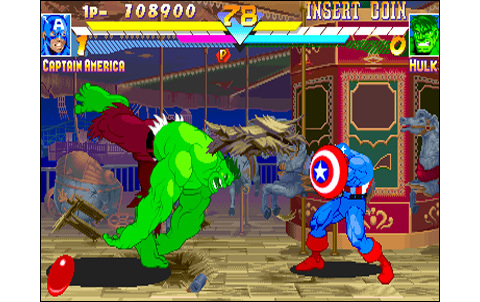 There's also Fatal Fury 3, or even Savage Reign/Kizuna Encounter which are looking a little like MSH... 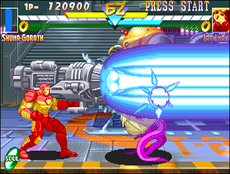 But unfortunately, never the Rolls of videogames systems hosted a game featuring the X-Men!